Thousands of Palestinians protested Thursday following the funeral in Hebron for 28-year-old Abdullah Azzam Shalaldah, shot to death by undercover Israeli gunmen who carried out an assault on the local al-Ahli Hospital to abduct his wounded cousin, Azzam Ezzat Shalaldah. The hospital raid by Israeli security forces disguised as Palestinians signals a further escalation of the brutal and lawless repression that has claimed at least 83 Palestinian lives since the beginning of October. The director of the hospital, Jihad Shawar, said that the raiding party consisting of between 30 and 40 men, including one who pretended to be a pregnant woman going into labor, entered the facility at about 3am Thursday. “They headed straight towards the surgery ward, where Azzam al-Shalaldeh was being treated,” Dr. Shawar told Al Jazeera. When the patient’s cousin Abdullah came out of the bathroom, he was shot multiple times in the head and body, he said. “They kept the hospital’s medical crew as hostages at gun point. They arrested the patient and took him away, leaving his cousin [to] bleed to death,” Dr. Shawar added. Their objective was his 20-year-old cousin, Azzam Ezzat Shalaldah, who was shot by a Zionist settler last month in the head and chest as he was harvesting olives. The young man’s brother, Bilal, told Reuters that when the undercover unit entered the hospital room they tied him to a bed. His cousin, Abdullah, “was inside the bathroom and wanted to wash for prayer. As he was exiting the bathroom, one of the undercover men shouted at him to stop and they opened fire,” he said. “He remained on the ground bleeding and they hit my brother on the head and took him away,” he added. 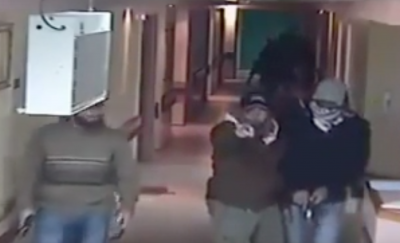 A video taken by hospital security cameras shows the Israeli raiding party coming into the hospital, some wearing fake beards and others women’s clothing and then pulling out firearms and rushing the surgical ward. They are seen roughing up one medical staff member before reemerging pushing Shalaldah in a wheelchair. The undercover unit, which is reportedly made up of Israeli soldiers, members of the Shin Bet secret police and border police, was seen recently attempting to blend in with Palestinian demonstrators and then pulling out guns and shooting them at close range. Israeli security sources claimed that Shalaldah stabbed the Zionist settler who shot him and that he was from a family connected to Hamas, the Islamist party that controls the government in the occupied Gaza strip. said Philip Luther, Director of the Middle East and North Africa Program at Amnesty International. Amnesty cited a series of extrajudicial executions carried out by Israeli forces. These include the shooting death of 72-year-old Tharwat al-Sharawi, who Israeli security forces claim was trying to ram them with her car when they opened fire and killed her. Video of the incident shows the car moving at a slow rate of speed toward the soldiers, who shot her to death after getting out of the car’s way. It also recounted the execution of Mahdi al-Muhtasib, 23, who was shot by Israeli soldiers after reportedly lightly wounding one of them in a stabbing attack in Hebron. “Video of the aftermath of the incident shows Mahdi al-Muhtasib writhing in pain on the ground before an Israeli soldier, standing a distance of some meters away, shoots him again,” the Amnesty report stated. The current unrest was provoked when right-wing Zionist elements, backed by the security forces, began demanding access to the Al-Aqsa mosque complex, clashing with Palestinians, whose access to the mosque has been increasingly restricted. Underlying the Palestinian resistance, however, is the mounting violence by Zionist settlers and Israeli security forces in the occupied West Bank and the steady expansion of Zionist settlements in the territory. The latest wave of unrest has seen a series of attacks by young lone Palestinians armed with stones, screwdrivers and knives as well as using their cars that have killed 10 Israelis. The deaths of eight Palestinians for every Israeli killed, not to mention the thousands of Palestinians who have been wounded, has done nothing to blunt the media’s portrayal of the unrest as the work of “terrorists” and hardline Islamists. So discredited is the PA that there was reportedly widespread speculation that it had been complicit in Thursday’s hospital raid. Last March, the Palestine Liberation Organization’s Central Council took the decision to “end security coordination in all its forms with the Israeli occupation” because of the systematic violation of previous accords by the government of Prime Minister Benjamin Netanyahu. Eight months later, no action has been taken on this decision, which would disrupt the operations of the Palestinian Authority and cut across the considerable economic interests of its leading personnel. Meanwhile, the draconian Israeli security crackdown continues to intensify. At least 416 Palestinians, including 122 minors, have been detained by Israeli security forces in the first 12 days of November. Last month, nearly 1,000 Palestinians, including 147 children, were detained, according to the prisoner’s rights group Addameer. Also on Thursday, Israel’s High Court of Justice overturned a lower court ruling, lifting a temporary injunction on the demolition of the homes of Palestinian families of youth accused of carrying out attacks on Israelis. The policy of expedited home demolitions was implemented by the government in an attempt to suppress the unrest through a punitive act of collective punishment. While the home demolitions will go forward, the judge who issued the injunction, Uzi Vogelman, has been assigned a personal bodyguard because of death threats from right-wing elements in Israeli. The two reportedly discussed an Israeli request to increase annual US military aid to Israel to $5 billion for each of the next ten years.